It was 25 years ago this month, in 1990, that Martha Stewart first launched her magazine with Time Warner. It was a bold and hopeful beginning for the caterer-turned-writer who had always dreamed of sharing her vision of good living with a wide audience of readers all over the United States, and beyond. 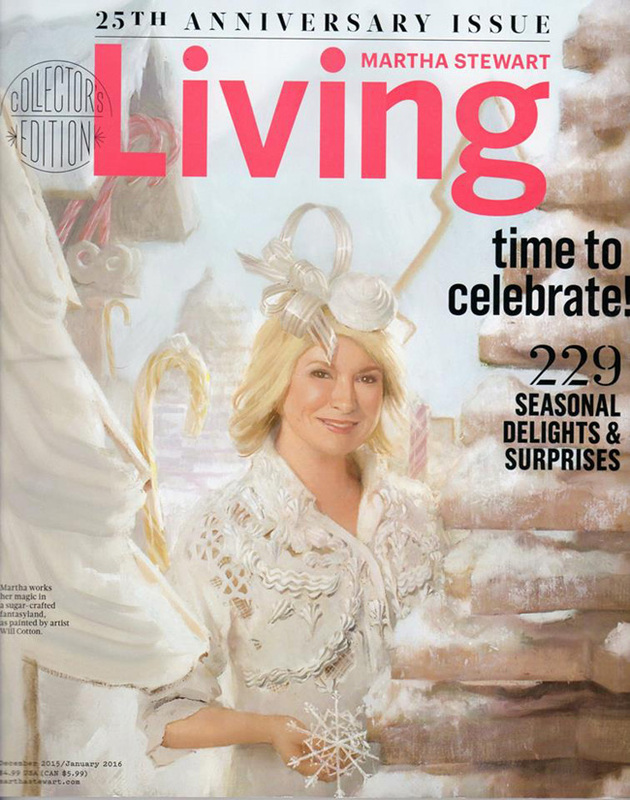 Martha Stewart Living became one of the most successful startups in the history of magazine publication. Within just a few years, subscriptions had jumped to more than two million with monthly newsstand sales nearly equaling that rate. And so, this month, on the 25th anniversary of the publication of the first issue, Martha Stewart Living has issued a special collector's edition for their December/January issue. In another first for the magazine, Martha is featured on the cover of the subscriber's issue wandering through a sugar-coated fantasy land in a painting by artist Will Cotton. This is magical! This is wonderful! This is exactly the kind of imagination and sense of whimsy that I love about Martha Stewart and her team. I can't wait to explore this issue! Thank you! I cannot wait. I have been so inspired by this publication. Ms Stewart is beautiful , interesting and can be very charming, but I wish she and her PR personnel did not think it is necessary to air brush every inch of character from her face. I understand as the " face" of her corporation she wants to project a vital/youthful look, but it should not be so obvious a effort. Cannot wait to pick this up. I won't really read it until December, wait for a cold (maybe snowy)/night, put on Christmas music, tea and wrap myself up on couch with this! Pure escapism! APM, if you're referring to the cover, it is actually a painting by Will Cotton, not a photograph! occurrence in all advertising photos. The only place to see her natural beauty is photos of Martha on her Blog. I just finished paging through the latest issue of Living and I so enjoyed the content. Naturally I'll go back and read the various articles but this issue has pretty much convinced me to renew. Some of the previous ones just haven't captured my interest but this one covered all the bases. I always enjoy the recipes and this particular batch was really nice...sometimes they're way too involved but not these. I've always felt that the average person wants to be able to accomplish some of the decorating and cooking things and do it with confidence. Anyway, this is a very special issue that most people will be able to relate to.